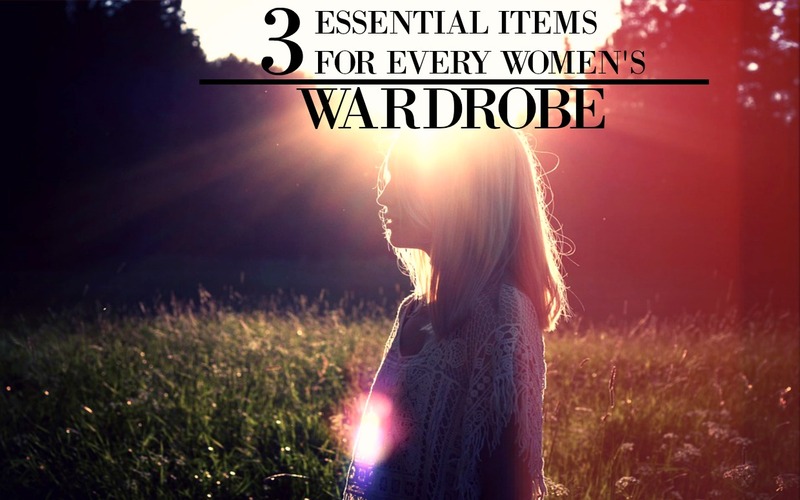 Having the essentials for our wardrobe is so important as a woman. Especially when there are so many fashion trends coming in and out that many people waste their money on. Whenever I go to the mall, I’m amazed at how many outfits there are where I find myself wondering why anyone would buy it… or design it for that matter. It reminds me of how I would look at clothing from the decades past and scoff at the horrible fashion trends. And now I’m wondering how often I’ll look back at the different styles that came and went in my youth… and cringe. Thankfully though, there are many pieces that are timeless or have the potential to go through the decades. They’re the essentials, and while there are a lot more than three, I decided I’d give you a quick and simple list of pieces you can buy to round out your wardrobe. You want items that are versatile, that’s important. Not that one red tank top with sequins that only looks good with that one pair of jeans. You need pieces that can be paired with many outfits and completes your look. A side note, I’m writing this during the cold seasons (unless you live in Southern California), so I plan on making one for the warmer months of the year as well. When buying a blouse, you want to take into mind that the two shades, black and white, make it the most versatile. It’s true that you could buy a light blue or pink blouse and have it work with a couple jeans, but you still need to remember that you want your blouses to go with many different outfits. So here are a few ways you can integrate a blouse into your wardrobe! This is probably the easiest way you can wear your blouse. I thought I’d mention it first, since I know I (and a lot of you) like simple. Finding a cute blouse that hangs nicely over a pair of colorful pants or some great jeans is a fun and fast way to create an outfit. I usually pair my neutral colored blouse with colorful pants because it makes my outfit pop. If you want to look smart, then tucking your blouse into your pants gives you a more touched up appeal. Undo a few buttons to reveal a well paired colorful under top to make things pop and you’ll add a little fun to your style of the day. One of the last ways you can wear a blouse is with a skirt. Here you can pick about any style of skirt, whether it’s floral, a bright solid color, striped, or polka dotted and that blouse will compliment your outfit with a touched up look. I absolutely love black tights! They can go with so many things and make any outfit look cozy or dressed up. They’re also neutral (alright, I’m being Captain Obvious here), so again, it goes with the theme of versatility. One of my favorite ways to pair it with an outfit is with skirts. Because I wear thicker black tights during the cold season, I feel more comfortable wearing shorter skirts. It makes the color of my skirt pop and can give it a bit of a cute appeal. It can also make the outfit look more smart and stylish, so that’s a plus. Dresses are basically the same, but when you wear black tights with a dress, it can suddenly give you a more mature and voguish appeal. One that I don’t see as often, but I know looks great (from personal experience), is wearing black tights with shorts. It can give you a bit of an edgy appeal if you wear it with cutoffs or dress up your outfit without even trying. Now pair some cute ballet flats with the black tights and you’ll have a great look down! Like the last two wardrobe essentials I mentioned above, I’ve noticed that the sweater has been around for quite a while. This is great because it means it’ll transcend through the years. Now not all styles are created equal, so you want to make sure you get the right sweater that won’t go out of fashion in two years from now. Another way you can wear a sweater is with a collared button-up shirt. This is an awesome way to make you look super stylish and smart. You can choose to tuck the button-up into your pants so it’s hidden underneath your sweater, or let it hang down below it. It’s such a great way to layer during the cold season. If you want to go for that more edgy (or cool kid) look, put an awesome jacket over the sweater. Another great way to layer up when it’s cold outside! Remember to choose the right style of sweater. What I mean when I say that is, when you’re shopping for a sweater as one of your wardrobe staples, don’t go for something that’s too out there. Find a style and color that will look cute or smart for a long time to come. Think of all the different outfits you have that it will go great with. Make sure it’s not cringe worthy when you look back at a photo of yourself in it in ten years from now. Last tip, pair it with a cute infinity or wrap-around scarf and you’re ready to go on a cold day! I hope this small and simple list of essentials helped, and if you have any other great ideas for some wardrobe essentials (I’ll be making a few lists later on), let me know in the comments or email me! I’d love to hear your suggestions!